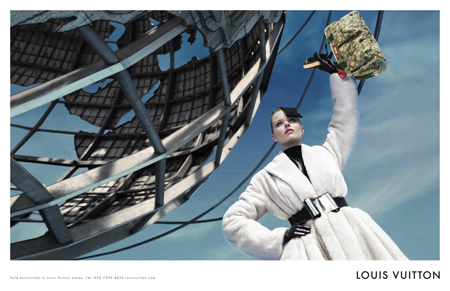 And here is the second fall 2008 ad campaign for Louis Vuiton featuring French model and actress Laetitia Casta. 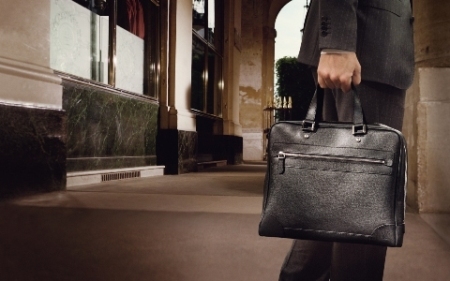 This time, the pictures shot at Pont Neuf in Paris by renowned photographer Annie Leibovitz are meant to reinforce the traditional and defining value of Louis Vuitton, and that is leather good. 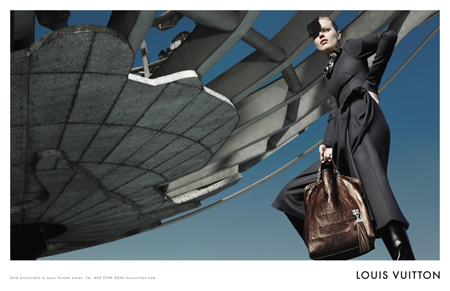 These ads have a timeless, romantic vibe, a "je ne sais quoi" that places Louis Vuitton in the fashion's classics. Last LV "spokespersons" were Catherine Deneuve and the Coppolas and I hear that Sean Connery is next. 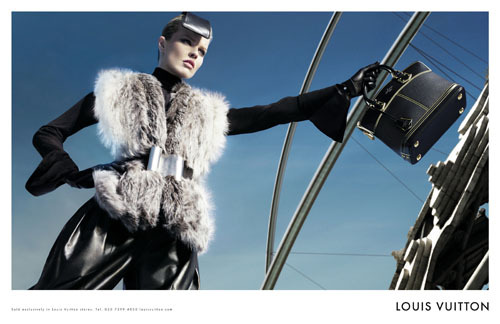 Why did Louis Vuitton carry two different ad campaigns for Fall/Winter 2008/09 season is an issue for their marketing dep. They send forward quite opposite messages. Is it well for a brand to undergo such dichotomy? 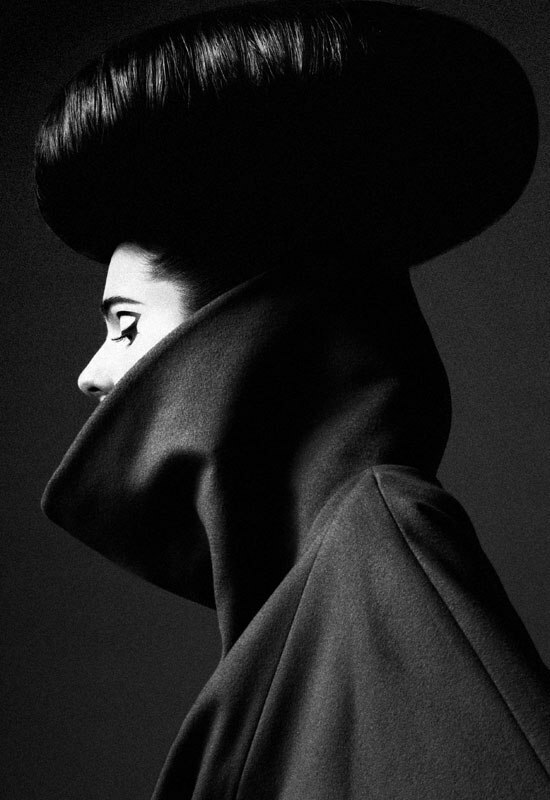 Here is the ad campaign for one of my favorite fall 2008 collections: Givenchy. 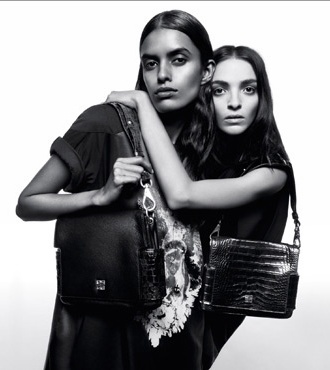 Using outstanding photographing skills of talent duo Inez van Lamsweerde and Vinoodh Matadin, the campaign brings together Riccardo Tisci's muse and friend Mariacarla Boscono, first Indian supermodel Lakshmi Menon, "it" girls Lara Stone and Natasha Poly and 90s supermodel Kirsten Owen. 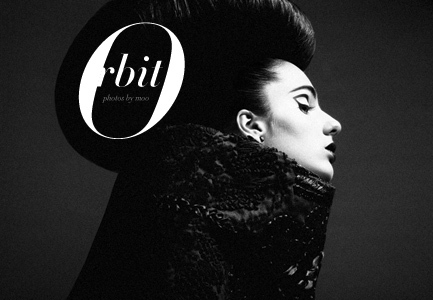 Beauty editorial entitled "Orbit" featuring a new-comer in the modeling world, Magalie Daignault, from Quebec. The pictures are signed by Toronto based photographer David moo King. Can you believe this girl is born in 1992? And yet how incredibly sophisticated she manages to look. 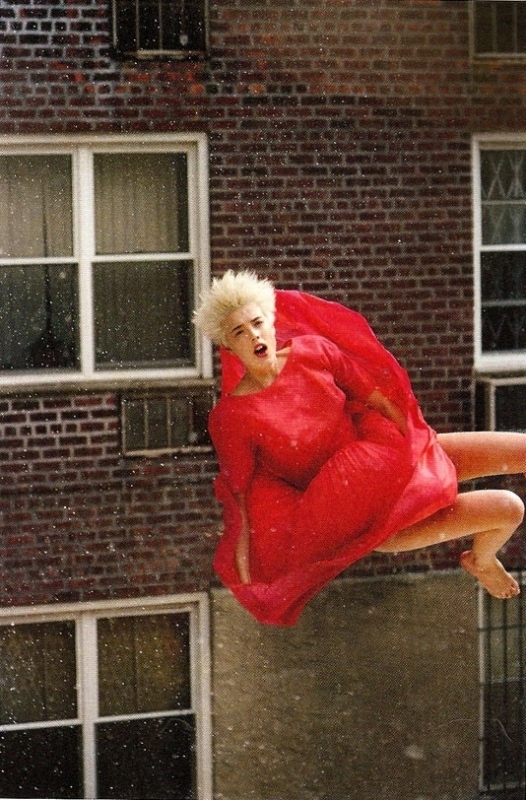 Fascinating shots done by photographer Ryan McGinley captured model Agyness Deyn in free fall, jumping off Manhattan building fire escape. The pictures (some of them of them showing Agyness naked or half-naked) are featured in the latest issue of Pop magazine, "The 80s Excess", evoking Eighties style icon Jenny Howarth. POP Magazine's editor-in-chief Katie Grand signed the fashion editing and the result is pure visual poetry. Art and fashion are meant to push boundaries so if these shock you that is a good sign. See the rest of them here. 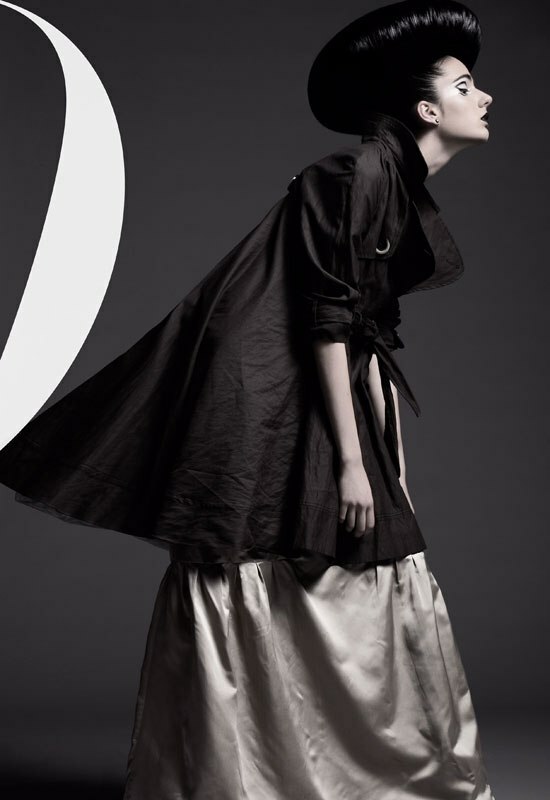 Usually I like fashion editorials with a story but I was pleasant impressed by these pictures from Avantgarde magazine featuring fresh face Dutch model Valerie Van der Graaf from SPS Model Management Amsterdam. 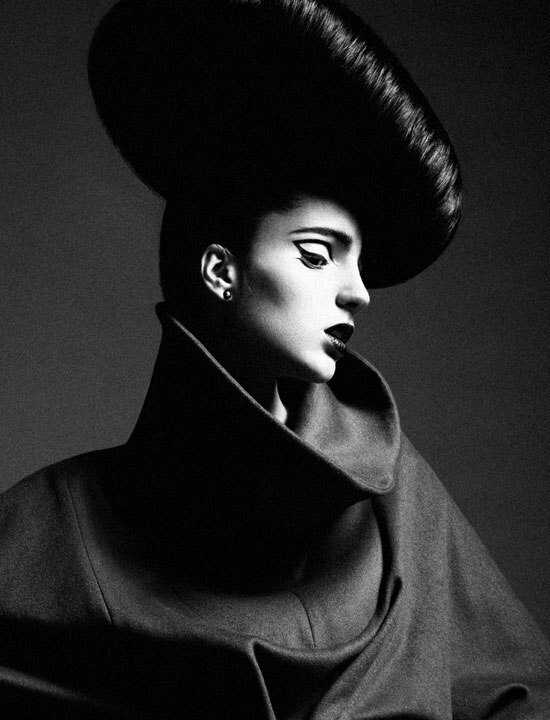 She recently joined Viva Models - Paris so we'll be seing more of her. These pictures have something wintry about them without showing any cold weather décor or fashion (like fur or knits). Romantic, retro, restless ... a mood set by black-and-white pictures of the Burberry fall 2008 ad campaign. Photographed by Mario Testino, the ads feature Rosie Huntington-Whiteley, called by the British press "the new Kate Moss", and former pop-singer, now film actor, Sam Riley posing as a couple with a certain history. The Kensington Gardens in a cold, foggy morning are used as dramatic setting. These pictures remind me a little of the classic 70s drama flick Love Sory ... but maybe I'm too sentimental. I love these new ads from Jill Stuart fall 2008 campaign. They catch up with the arty mood of the past season and translate it into colorful, splattered with paint backgrounds that remind of Pollock's paintings. The chaotic settings manage to emphasize a glamorous look, with German beauty Toni Garrnd modeling sophisticated ink blue and glossy black outfits. With a luxe boho fall collection, the Woodstock/'bohemian nomad life' references were pretty predictable for the Gucci fall 08 ad campaign. The photos were done by notorious duo Inez van Lamsweerde and Vinoodh Matadin, in a beautiful location (Majorca) featuring blonde beauties: Lily Donaldson, Abbey Lee Kershaw, Eniko Mihalik. The story is quite simple: the girls dance around being all glam-chic-flower-power, showcasing this season must-haves over the knee boots, fringe bags, folksy prints; while the boys walk around all dressed-up. Nice! News from Paris photo editorial featuring Sasha Pivovarova passes in review the hottest Parisian looks for spring/summer 2008 season. The City of Lights shines with creativity: artistic details, vibrant colors, sheer fabrics and glamorous silhouettes. La cage aux folles - a photo editorial featured in Elle Magazine (June 2008 issue) dedicated to the eclectic style, so in fashion these past few seasons. Bold color combinations, different prints and textures; say a sheer, silk voile blouse teamed with a neoprene skirt. The key to a perfect styling is to handle fashion with studied nonchalance for an effortlessly chic look. Oh, and also consider a crazy up-do. with a rich color inspiration, which went from sienna brown to cerulean blue to old pink and powder hue, while Renaissance style was a good pretext for shaping taffeta, muslin, tulle and organza into extravagant flourishes and floor-sweeping wide trains. , destined for resort 2009, evokes a luxury trip down the Nile alongside Cleopatra. Antique Egyptian style is the main inspiration with golden embroideries adorning stunning gowns and dresses, all skillfully pleated and draped. The color palette is kept simple (ivory, blush and black) to let the embellishments shine. Designer and founder of Paule Ka, Serge Cajfinger was inspired for his fall 2008 collection by movies like â€˜Sue Lost in Manhattan' and â€˜Grey Gardens'. Like all his designs, those dedicated to autumn/winter 2008/09 season celebrates timeless chic paying tribute to the spiritual, sensual and eccentric personalities such as Faye Dunaway or Katherine Hepburn. First couture show for young designer Alessandra Facchinetti brought a fresh vibe to the Italian fashion house of Valentino. The starting point was a new strong romanticism, without the typical Valentino sweetness. Alessandra found inspiration in van Dyck oeuvres, contemporary paper sculpture and the house embroidery archive.